An American Spa is just a hot tub, right? WRONG! Transform your spa area into an inviting place for entertainment or even create a personal escape to a private getaway. To get the most out of your American Spa, make it a destination. Make it a place where when you get into it, it transports you somewhere other than your backyard. Add some foliage, some Metro Surrounds seating, place it near the Cal Flame grill, or even completely surround it by trees for an exclusive getaway. Adding foliage around your spa is an essential part to adding color in the space. Green is a great complimentary color. Plus, seasonal, colorful flowers add a “pop” of color. Creating a fun and inviting space for your spa will make you appreciate your purchase, and you will see that you will use it more often. Now that you have the colors in the area set up, lets add some functional features to the area. Having people over during the weekends? Not a problem. Make sure you tell them to bring a bathing suit. 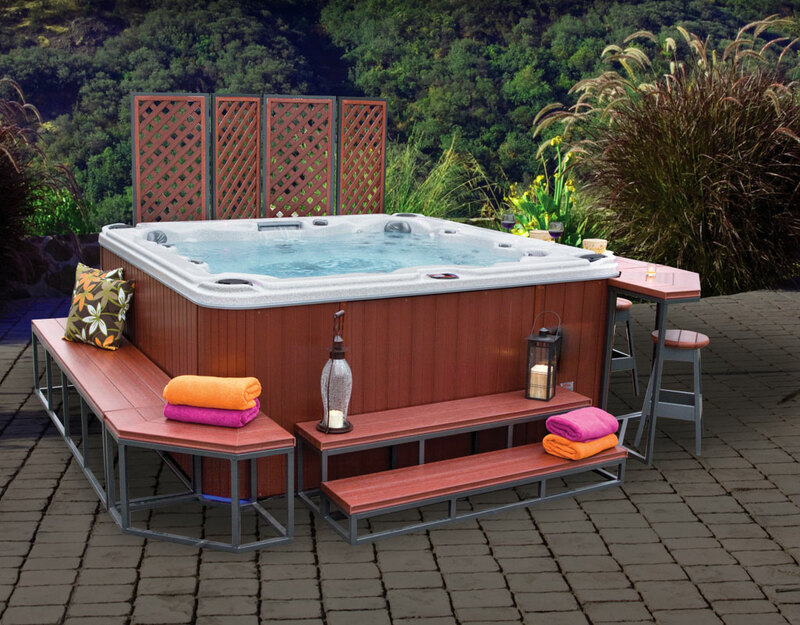 Once you have completed your portable hot tub space, your friends will be eager for an invitation the following weekend. Let’s start off by adding some seating. A Metro bench next to your spa is a multipurpose feature whether you have friends over or not. You can put your shoes, towels, robe, and shirt on it. When your friends are over, not everyone will want to get in. Give them somewhere to sit and relax, so they can still be part of the group. Adding a high top table is another great feature to add next to your American Spa. During a hot day, play some cards, have a drink, eat some food and then get yourself in the spa to finish off the afternoon. A grill is the ultimate feature to add in your spa entertainment area to make it the ultimate party spot. While you entertain and grill, people will relax, soak, and gain an appetite. “Summer or winter, BRING IT!” With such an awesome setup, you will be the talk of the neighbor and amongst your friends, no matter the weather. If you aren’t part of the party committee, that’s OK. We have you covered as well! Looking for a quite and serene getaway? Plant your tall bushes, shrubs, or trees in a tight pattern surrounding your American Spa. Not only will those tall plants provide privacy, but it will also block out noise to make your personal getaway a great place to escape. So, why should you decorate around your American Spa? Easy, to get the most out of your portable hot tub year round. Want to know more about American Spas, Subscribe now! Like us on facebook and share your American Spa to Win some Goodies! Already own an American spa? Give us a 5 Star rating and share it with us to win a free prize!